We hope you are all enjoying the increase in migrant numbers and diversity! The last few days have been phenomenal for birders across much of the state. This is all due to a slow moving cold front which brought us loads of rain and westerly winds. Conditions as such aren’t a birds best friend, but a birders dream, that’s for sure. The air is clearing and these birds are likely going to take flight starting tonight. It’s hard to tell how many birds will leave and how many will stick around. This all depends on when they arrived and how much food they have found. Another factor will be the winds. If winds aren’t optimal, migrants may stay put or move short distances in hopes of finding better habitat. 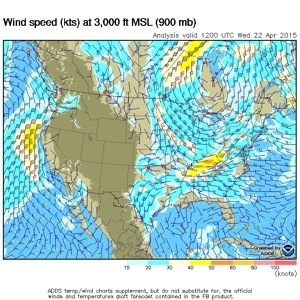 West winds aloft persist, while weak, variable winds can be felt on the ground. Birds may stick around for a better night to fly, so they may be around tomorrow! *Just uploaded* We have not been able to download the radar today, but we did watch it overnight and early this morning. Many migrants were out over the FL Straits last night. Winds and the unsettled atmosphere over the southern Gulf sparked off large areas of precipitation, likely put birds down in the Dry Tortugas, the FL Keys and southern Miami-Dade which covers the national parks and most the migrant traps. Look out for birds if it was raining over your area overnight and this morning. You should see a noticeable difference from the days past. 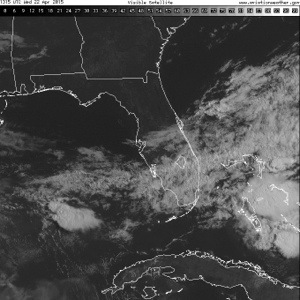 Here are a few satellites images showing that the the majority of the clouds have moved east of the state, but still some moisture lingers over the southern Gulf of Mexico.